Sunday, July 1st, 2012, 12:00 pm. I’ve gotten myself all wound up over the discovery that there are bookmarklets available to enable otherwise disabled downloads on Soundcloud tracks. Now, correct me if I’m wrong, but aren’t most Soundcloud users independent artists? If they choose to disable downloads, but enable streaming, aren’t they doing that for a reason? Isn’t it worthwhile respecting that, especially since they’re not getting major label funding? According to some of the comments posted after mine, apparently not. The general gist seems to be that people don’t care – they want a marriage of convenience and not having to pay for something. I never thought I’d get sucked into the recent debate provoked by the honest post by NPR intern Emily White (about her 11,000 song library and how she only paid for 15 CDs in her entire life), but I inadvertently did. The conversation over the Soundcloud bookmarklet is but a microcosm of a greater discussion. Have you taken the time to read any of it? Cracker’s David Lowery provided what was probably the most thoughtful response. Many others followed, ad nauseam: 1 | 2 | 3 | etc. There’s no point in sugarcoating this. I’ve seen my own enthusiasm about being a musician start off a raging torrent, and dwindle down to a nearly dry stream. Years of gigging with One Drum, De La Buena, Sindoolaa, and Urban Empress & the Urbanites took their toll. I no longer want to play for an audience, and instead long for long hours spent working on songs in the studio. Flip side? I need to pay the bills. Independent musicians typically only make residual income on recorded music, unless they get lucky and sign a sync licensing agreement to get their songs into TV or films. Thankfully, I have skills above and beyond being a musician. Had I put all of my eggs in one basket, I would be in a terrible place. I consider myself lucky. As for the debate about the Soundcloud bookmarklet, I’ve copied the dialogue below, for the reader’s convenience. Click through to Github to chime in. As an independent artist, I’m glad this tool no longer works. This is a fine example of people not only taking musicians for granted, but disrespecting the wishes of the musicians to not have their music downloaded without permission. Well independent artist guess what I will never get to know your music or care to anymore … nor will I pay hundreds of dollars to see you in concert. I’m sure that the 4 dollars in tracks that I “steal” are made out by the fact that I spent hundreds of dollars to see these artists live. How about you first pray to become popular enough so your music is worth stealing. Thanks for your thoughtful response. Judging from the lack of punctuation in your sentences, and your assumption that artists you pay hundreds of dollars to actually play good music, I’m going to guess middle school, or (maybe) high school, and very likely suckling the teat of entitlement. I’m not sure that I should even gratify your comment with a response, but you’ve raised my ire for several reasons, and I hope my monologue might get the attention of the developer. Firstly, if you can take enough time to search out a bookmarklet to self-righteously “borrow without asking” songs from Soundcloud, then you could take that same amount of time to simply ask the artist for a song. Why not reach out and make a meaningful connection in the world – after all, these are independent artists we’re talking about – not the inaccessible 1% of famous and signed musicians you’ve (maybe justifiably) placed on a pedestal. Most unsigned artists I know (myself included) would welcome the opportunity to have a dialogue with a potential fan, and might even be open to barter options if $1 were too much to shell out for a tune. For example – if you visit my site, and leave a valid email address, you get a free download. This brings me to my next issue: the worth of a musician’s work. It’s great that some musicians play shows in which their fans pay upwards of $100 for a ticket. However, for 99% of musicians, this is simply a daydream or an aspiration. Good musicians spend several hours a day practicing their craft (time unpaid), and are often subject to the limited compensation provided at cafés, bars, clubs, etc. If you do the math, an average musician who spends 5+ hours practicing, and plays a gig for 3-4 hours (add to this out-of-pocket transportation time and cost, and set-up/tear-down time), you’re counting on making less than the average person flipping burgers. Why? To please people with a mentality like yours? Cobain sang, “Here we are now, entertain us” for a reason, didn’t he? He wasn’t exactly clamoring to win the approval of his audience. He wasn’t praying to become popular enough to have his music be “worth stealing,” and neither am I. If the average independent musician makes less money than a person flipping burgers, how are they to record an album in a semi-decent studio priced at upwards of $50 an hour? Ah, yes, flipping burgers. Brilliant. So an average musician, who might have more talent than some of the acts you’re seeing paid for with your parents’ money, is doing shifts flipping burgers, practicing 5+ hours, putting in another 6 hours traveling and gigging (per day), and being gracious enough to stream the product of her/his creative outpouring on Soundcloud just so someone can skirt the protection and download it for free? Talk about devaluation. Now that I’ve gotten all of this off my chest, please accept my apologies for insinuating that you’re an entitled middle or high schooler sucking on the teat of entitlement, or that your parents paid for your concerts. PM me your email address, and I’ll send you a link to download a free tune. You seem to think that being a musician is a job. It’s not, it is a hobby. You seem to think you’re entitled to payment for the recorded fruits of you hobby, because you chose to make music and making music happens to be difficult and requires a lot of practice and knowledge and money. You seem to think that, even though you put your recordings on the internet for free, for everybody to grab. In my opinion you’re not entitled to payment. Being a musician can indeed be very hard, I’m not denying that. But it is a choice to spend your time making music –(ideally) having fun!–, instead of, for example, flipping burgers to pay the rent. This script ~doesn’t~ didn’t do anything the artist didn’t give permission for. Soundcloud sends you an 128 kbps mp3 file and plays it with it’s player. All this script did is, in addition to playing it with Soundcloud’s player, is save that very same mp3 to your hard disk. If you don’t want Soundcloud to send people an mp3 of your recordings, you should not put it on Soundcloud (or any equivalent website) in the first place. By the way, isn’t it one hell of compliment when someone goes to ‘all’ the trouble of downloading a song of yours to be able to listen to it on his/her iPod? @britishtea: You have managed to insult every musician I know with your statement above: “You seem to think that being a musician is a job. It’s not, it is a hobby.” Just because people “play” music doesn’t mean it isn’t work. There are musicians who earn all of their income via music – people who practice, perform, teach, etc. Does that make it a hobby? I wish there were a script to prevent people like you from having any access to music, just to serve you right for taking musicians for granted. As for this script, it enables something that is disabled by default for those musicians who chose to disable downloads. If an artists chooses to disable downloading, but allows streaming, why not just respect it? And, again, I bring up the point of dialogue – why not just ask? Why take? I’m a musician myself 🙂 I’m not saying being a musician can’t be a job. It obviously can. I’m just saying that if you chose to spend your time making music, you aren’t (automatically) entitled to payment. Especially not when you put your ‘product’ online for free. If you find someone who will hire you to record an album, great! There’s a small difference between streaming and downloading, one that is mostly visual. In the end they achieve the same result: they deliver a file from a server to a client. The client can do whatever he wants with the files he receives. One of those things is play the file with the Soundcloud player, but there is a lot more you can do with that file. If you have a problem with that, you shouldn’t let the server send files to client in the first place. As to your point of dialogue, the answer is simplicity. P.S. I’m a musician myself. As a musician, you’re obviously used to shooting yourself in the foot when it comes to visualizing the value placed on your creative efforts. I suggest you think more highly of your efforts. 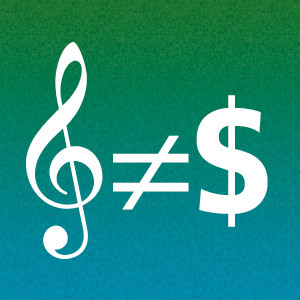 It’s true a musician who puts their stuff online for sale isn’t entitled to payment (that is a factor of how “deserving” they are in the eyes [or ears] of the listener [it’s subjective, isn’t it? ]), but it also doesn’t entitle the listener to the track for free, especially without asking. As for the streaming/downloading debate: the whole point in preventing downloading is to ensure that a client doesn’t do whatever he/she wants with the file “received”. Streaming a file doesn’t entitle the listener to ownership – it entitles A streaming file isn’t cached locally – it is streamed from the server. In many cases, the actual URL is obfuscated. Why go to all this trouble if there is “no difference” between downloading and streaming? As to your response about simplicity, why not call a spade a spade – it is laziness and utter disregard for a human connection. It is rooted in a trigger-happiness based on convenience. And I would argue that as a musician, this trigger-happy mentality has already helped undermine your career as a musician, hobby or not. P.S. Send me a link to your Soundcloud tracks, so I can use this bookmarklet to “stream” your songs.